Company Law Handbook 2017 addresses the key features and principles of modern company law from a practitioner's viewpoint in a practical, clear and user-friendly style. Company Law Handbook 2017 is designed to keep you up to date with changes in the law as it affects the running of a business. 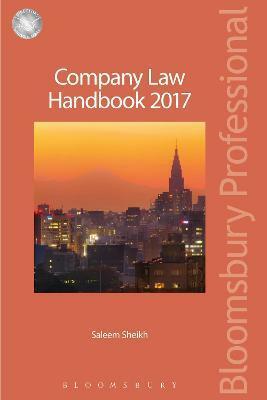 Rather than taking an encyclopaedic approach, Company Law Handbook 2017 takes a more practical approach by charting the company lifecycle from pre-incorporation, through incorporation and culminates with the winding up process, addressing, in detail, the essential requirements in establishing a company, including the steps, procedures and documents that are required during the existence of the corporation. A significant feature of the handbook is the consideration of new topics including legal aspects of corporate social responsibilities, human rights, corporate bribery and corporate manslaughter and topics that have a direct bearing on the legal and practical aspects of company law. The handbook also highlights significant cases and principal judgments that impact on UK company law. Checklists guide you through legislative provisions and their application to the day-to-day running of a business throughout its lifecycle, and key definitions at the end of each chapter make it accessible by simplifying the legal concepts involved. Saleem Sheikh is a solicitor and a Visiting Senior Research Fellow at the University of East London.